If I Die is emotionally brutal — heartbreak, impending death, love — and I want to thank Rachel Vincent for every painful moment of it. Like with so many of her books, Vincent is able to conjure such character connections as to force readers to experience the highs and lows alongside. The main element in the fifth Soul Screamer book is Kaylee dealing with Tod seeing her name on the Reaper’s list. (It’s not a spoiler, it happens at the VERY beginning of the book.) Kaylee is told she’s going to die and when. She has six days of knowing it’s almost over, and she does exactly what I’d do: goes into denial. Everyone wants her to cry, to rage, and the like, but she’s trying very hard not to think about the fact she’s supposed to die. She has to try and keep her dad from doing something stupid and noble in an attempt to save her. She wants to spend important moments with Nash, because they’re almost gone. But, mostly, she wants to know everyone she loves will be safe after she’s gone. Which brings us to a new teacher at Kaylee’s school. Girls all around the area are dying from miscarriages, including one Kaylee knows, and well it just happens that Mr. Beck is their teacher. Sabine is the first to point out he’s not human, and while they aren’t sure what he is they’re convinced he’s trying to make some babies. When Mr. Beck turns his attention toward Kaylee’s best friend Emma, oh it’s on. Kaylee throws herself completely into the distraction of finding out what Mr. Beck is and stopping him. This means a return visit the mental health facility Kaylee was placed in before she knew she was a bean sidhe. (Did I mention this book brings the emotional heavy?) It also means working with Tod and Sabine more than usual, especially the former which riles Nash something fierce. The girl is told she has six days to live and, yet, you can’t stop relationship drama when it’s destined to come. I won’t tell you what happens on this front, but it’s perfect. It’s not easy for Kaylee to get there, but the end result feels so right. 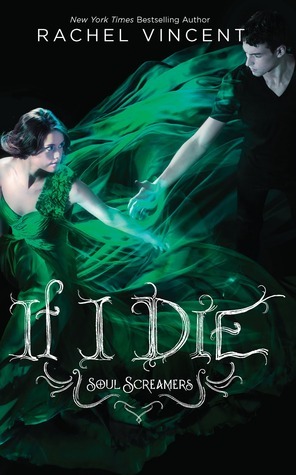 If I Die is the heaviest book to date in the Soul Screamers series; it’s also the best. Vincent kept me on edge and constantly muttering “no way” as she threw twist after twist at me. She’s pushed the series in a new direction that will certainly breath life into future books. I’m so ready for more. I haven’t read any of the Soul Screamers books yet, but your review is totally making me want to! I’m going to have to check them out! I have not read the Soul Screamers books yet either, but I am beginning to chomp at the bit and my fingers are itching. The budget gods are sending up red flags and my wishlist is growing LOL Thank you for sharing about this incredible book today.